I saw a picture of this silly sheep when I browsed some animal pictures on the internet for Little A's homework last night. 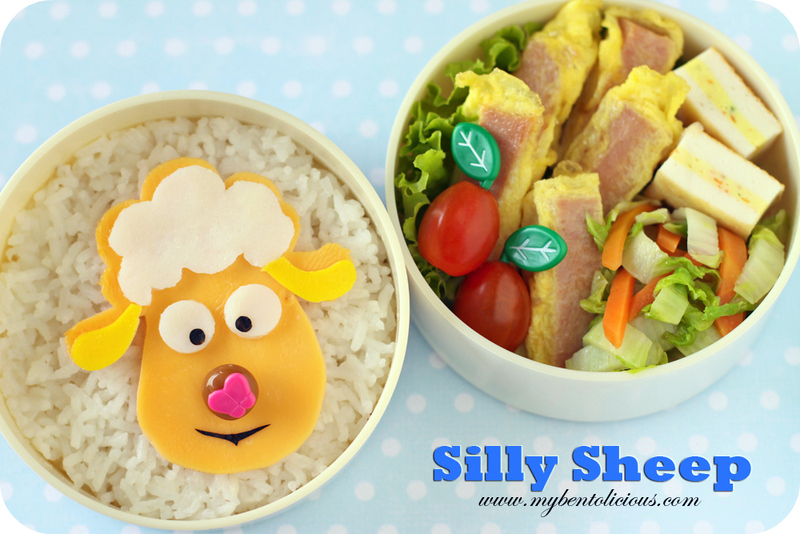 So I cut out the silly sheep from the egg sheets and put it on the top of steamed rice. I was looking for my butterfly puncher and cutter to make a butterfly on the silly sheep's nose then remembered that I have the butterfly pick. I quickly use that. I need to re-arrange all the food picks in my boxes this afternoon. I don't know how many sets that I have collected so far. I am not obsessed to collect them but when I find a new cute set, normally I can't resist to buy it. My bento shopping isn't so crazy as before, believe me. I try to cut down the budget for bento shopping this year. I only buy something that I will use and I need for my bento making. Inside the other round box : spam meat with egg, fish cake tofu, cherry tomatoes, and stir fried Chinese cabbage with carrots. what a happy bento! the sheep is looking at that butterfly on his/her nose and thinking, hmm, what do i do about that! Ah so cute! I know I shouldn't say this but.. I really love Spam. lol! Except we don't have Spam anymore here, we have fake Kam. ;p I love your variety of picks. I need to expand my collection this year! @Dina : Thanks a lot Dina! hahaa...the silly sheep is real cute..makes me laugh! It's such a cute sheep, I love the expression and the way you used the pick! What is fish cake tofu?? Hi, I am a Bento newbie and am fascinated by the various interesting bentos that you make. (1) which is a good online place to get the bento tools? (2) when do you cook the food for these bentos, in the mornings? I tell you, I always blow my budget when it comes to bento shopping!!! Sometimes I will buy multiple and send to friends!!!! Btw, I love those spam with egg! - Check on eBay too. @Journal Mommy Yenny : Thanks a lot dear! @Angeleyes : hahaha ... I knew it :) Spam & egg FTW! So simple to cook. The egg sheep is super cute...! You're a real expert in making characters using egg sheet :)! I need to learn how to make egg sheet too because I have never tried it before. What a great bento. I am sorry I haven't been to visit in a while. Took a break from bento for a bit because life got a little crazy! Been fun getting bento stuff back out though- I really missed it. Love your Bento! How do you make the egg stick to the ham? I tried but the egg doesn't coat the ham nicely like yours look in the photo. Thanks.